Kepler Communications, a small satellite startup, is designing a constellation of CubeSats for Internet of Things (IoT), machine-to-machine (M2M) and inter-satellite communications services. 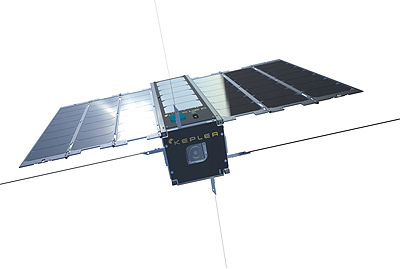 Kepler is starting with two 3U CubeSat operating in Ku-band and providing store and forward services, with the first to be launched in late 2017. The satellites ares named KIPP and CASE in honor of fictional robots from the movie 'Interstellar'. The constellation would then expand to an initial size of 10 to 15 satellites in a polar orbit. With this fleet, the company would provide low data rate communications for various user terminals to the satellite, and a very large pipe to the gateway when over ground stations. For a late phase, the constellation might be increased to 120 satellites. The 3U CubeSat feature deployable solar arrays, software defined radios (SDR) and high gain antennas. Clyde Space has been contracted to build the satellites.